Since its introduction to Japan from China in the early 1200's, "Kenpo/Kosho" has always been a Family Art. Passed down through 20 generations of Yoshida "Great Grand Masters"! 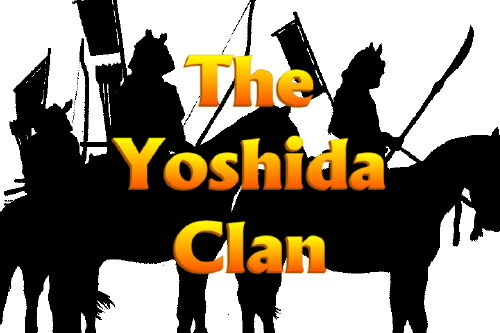 The Yoshida's are an ancient royal Japanese Warrior family that goes back as far as recorded Japanese history. The Original "Yoshida" family name was Urabe - They took the name Yoshida from the famous castle by that name they once owned. Not only were the Yoshida's a powerfully Samurai warrior family but they exercised great control over the "Shinto Religion" - the official and ancient religion of Japan. Shinto literally means "way of the Gods! The Yoshida's were warrior lords (bushi) and along with their immense number of military retainers (samurai) were part of an important base of Japanese culture and civilization for over 800 years. The Yoshida's were also daimyo or great lords. To be considered a "daimyo" you had to have land holding of at least 10,000 *kyku.They also had major control of the "Shinto" religion and with it large armies to protect the holding of the church. This combined with their own land holding gave them large armies to be used to fight upon the side of the "Shogun" when he needed their support. It was because of this support that they became the first retainers of the famous "Yoshida"** castle built in the 1500's. The Yoshida's also had a great deal of influence with the "Emperor" who the Japanese believe is directly descended from the Gods. *kyku - was the standard measurement for wealth - which for 1500 years was measured in the rice yield. a "Kyku" is about five bushels of rice - or, the amount of rice need to feed one adult male for a year! In the middle part of the 13th century, Zengo Yoshida, a prominent member of the Yoshida clan would embrace the "Rinzai" sect of Zen Buddhism and eventually this branch of the Yoshida family would build their own "family" Zen temple on Mt. Kinkai. The warrior monks of the Rinzai sect in China would also bring with them the unarmed Martial Arts of the Shaolin temple: Kenpo/Kempo/Kosho! For the next 800 years the Yoshidas would take the "war arts" of the Shaolin Temple, along with Zen and assimilate and blend them into the Japanese culture. They would be become part of the "Code of Bushido" by which every Samurai lived. For over 800 years Zen and Shintoism would co-exist as compatible religions with priests from both religions meeting in the same building and performing similar religious function. That would come to an end with the overthrow of the Shogun (1185-1863) and the "Meiji revolution: would once again restore power and control to the royal family where the "Emperor" was accepted as a God. With the Emperor and the Shinto religion now in full control of Japan - the Yoshida's who never gave up their control of Shintoism once again held a great deal of power and influence with the new Emperor and new government! The Japanese lineage of Kenpo starts with Zenko Yoshida. He would become the first important Yoshida to embrace the Rinzai sect of Zen. 1st Kosho/Kenpo/Kempo grand master: Zenko Yoshida (1232-1297) approx. followed by 18 more generations of Yoshida (Rinzai) grand masters! Female blood members of the Yoshida Clan were also taught the family art of Kosho/Kenpo. The Yoshida children stared studying at the age of five. This would be true of James Mitose and his sisters. 20th Great Grand Master of Kenpo/Kosho - Sukuhei Yoshida (1853-1936). Sukuhei Yoshida was the father of Kiyoko Yoshida (1890-1943/44), and the Grand Father (and teacher) of Masayoshi Mitose: (James). Kiyoko (Yoshida) Mitose was the only daughter of Sukuhei Yoshida. There was also one older son. Kiyoko was the mother of James (Masayoshi) Mitose. February 7, 1937 Masayoshi Mitose brings 800 years of Kosho/Kenpo heritage to Hawaii. The Kenpo/Kosho heritage of James M. Mitose is the heritage of the Family of all Kenpo based styles. It is considered one of the oldest ryu around today and is one of the most complete systems of fighting available. Through Kosho Shorei Ryu students learn unarmed combat, Kata, philosophy and history of the art and classical weaponry and tactics. published 1994 by Samuel Weiser, Inc.
"The art of Chuan Fa is what the media often (and incorrectly) calls Kung Fu. Proper Chuan Fa embodies a tradition from which most of the significant schools of Karate, Tae Kwon Do, Thai Boxing and other "martial arts" have developed their technique. It is also a vision of human potential that is desperately needed in modern times. Chuan Fa teachings have directly influenced -- and may have, indeed, created -- the Japanese Art called Jiu Jitsu, from which Judo came, and via this, the art of Aikido." No Matter in which language, English - Japanese or Mandarin Chinese, one pronounces the characters on the left they still convey the same concept. The martial art that we practice at Tracy's Karate Studios began in India among the royal Warriors 1000 years before Bodhidharma, a 28th generation Buddha, introduced what was to be later inappropriately named Kung Fu among the Chinese monks in their temples. Kung Fu is only a term that describes one's most skilled abilities, e.g. a lawyer's kung fu is his practice of law, a carpenter's kung fu is working with wood and its related projects, etc. Kung Fu is not a style of martial art. Ask any individual of oriental descent if they study kung fu and they may not understand what you mean. From India to China and then into the islands of Japan and Okinawa and beyond, kenpo is a system of martial arts not a style. A system is an integrated whole whereas a style is only a portion of a system; however, each style may be a micro-system within itself. Kenpo is a Japanese art of self-defense that was brought from China to Japan about 700 years ago by the Yoshida clan. The word means literally, "Fist Law," and one who practices Kenpo (literally a boxer of the Boxer Rebellion) is a Kenpi. The Chinese style was well suited to defend against the various unarmed Japanese martial arts of the 13th century, and few modifications were required to overcome the new unarmed systems that developed over the next 7 centuries. During this same period the Chinese system from which Kenpo was derived underwent so many changes that, while most of the Kenpo techniques can be found scattered among the hundreds of Chinese fighting systems, there is no single system in China today that resembles Kenpo. 75 years ago Kenpo was so well known as an effective fighting art in Japan that many Japanese styles that had no connection with Kenpo claimed their art was derived from the Yoshida Kenpo. Some even went so far as to claim their masters had been training directly under Chinese kenpo masters. Similar claims have continued to this day, even though there has not been a Chinese kenpo master for centuries. Kenpo came to Hawaii, shortly after the turn of the century, when a Grand Master of Kenpo, Kiyoka Yoshida, was sent to the Islands by her family, to marry Otokichi Mitose. In 1920 Kiyoka sent her 3 year old son, James Mitose, back to Japan to be raised by her parents. There he studied Kenpo and became the first Mitose to Master his mother's family art of Kenpo. He returned to Hawaii only after his father's death in 1937. After the Japanese attack of Pearl Harbor, James Mitose began openly teaching what he called Kenpo Jiu Jitsu and continued to teach until his retirement in 1953. One of Mitose's top students was "Willy" Chow, who became his second black belt and Assistant Instructor. In the spring of 1949 "Professor William K. S. Chow" opened his own Kenpo club and coined the term "Kenpo Karate" to distinguish his system from Mitose's, even though the two systems were virtually identical. Ed Parker was a student of Professor Chow in Hawaii, and was the pioneer of Kenpo to the Mainland. The system of Original Kenpo he taught in Pasadena, California from 1956 to 1960 was the same as that taught by Mitose and Chow. In 1961 Ed Parker and Chinese Kung Fu Master, James Wing Woo, co-founded Traditional Kenpo, and the master of those two systems was Ed Parker's first black belt, James Ibrao, and it was under Ed Parker and Jimmy Ibrao that the Tracy brothers learned Kenpo. When karate began its rise to popularity in the mid 1960s, Tracy�s dominated the tournament scene and over the years nearly 80% of the world-class Kenpo fighters had trained under the Tracy system. Because of this, and the practicality of Kenpo in real fights, it has developed such a reputation that many martial artists, including Tae Kwon Do instructors, now claim they teach Kenpo, even though they do not. "I come to you with only open hands. My hands will bear me out." (2) Nearly all other attacks begin with the attacker at close quarters. While it is popular for movies and television to have long, drawn-out fights in which dozens of kicks and punches are delivered, those fights are as phony as the long drawn-out movie fights that preceded the martial arts. They are pure fantasy. The fact remains that most attacks begins with a grab, and Kenpo Jiu Jitsu, has a counter for every imaginable grab. These counters can range from simple escapes to joint locks and breaks, followed by restraints or disabling strikes. Likewise, since most other attacks are punches or strikes, Kenpo employs counters that utilize blocks, or strikes, joint and nerve strikes locks and breaks. And the important thing to know is that Kenpo, as it was originally taught in this country, is as effective today as it was in 1942, and it is an art which can be learned by nearly everyone. This JU-JUTSU book was written when all of this information was current. Kempo was a well known and established killing art! In 1878 the new Japanese government eliminated two traditions: first they eliminated the Samurai as a class and outlawed their wearing of swords and at the same time ...... (KEMPO) was declared an illegal practice when the sanctity of human life was recognized under the new regime. Prior to this time the Samurai had the power of life and death over anyone of less rank. If they thought a commoner or peasant had offended them in anyway, they could kill that person with complete immunity. For those of you who saw the TV show Shogun there is a classic example. In one of the opening scenes peasant does not properly bow to a Samurai - for this offense the offended Samurai draws his sword and beheads the offender. Wiping his blade of the blood he continued on his way. This JU-JUTSU book also indicates that at this historical period Kempo was a well known (Deadly - Killing art). Also the Japanese were well aware of its Chinese origin. During this period in Japan's history they were trying to eliminate as many foreign influences as possible. At this same time they also outlawed the various sects of Zen and Buddhism and once again established "Shinto" with the emperor being a "God" as the official religion of Japan. As you can see, the author S. K. UYENISHI has very impressive credentials. His father Kichibe Uyenishi was also a great Ju-Jutsu instructor and practitioner. The father of the author was alive during this turbulent period (1867-1899) of Japanese (and Martial Arts) history were the old feudal system of Japan was replaced by the Meiji regime. This is page 15 - this is the important page! Grandmaster Al Tracy has added color to some of the main points. One of the styles alluded to, known as the Kempo, which may be roughly described as a Method of killing people, possessed many points of resemblance to Ju-jutsu but was totally different in practice, being a system of self-defense against sudden attack with intent to kill and replying thereto in kind. It was certainly more closely related to ju-jutsu than are Boxing (even under the old Prize Ring rules) or le savate to Wrestling. It might perhaps be best compared to that very strenuous old Greek Physical Contest, which was known as the Pancration. By-the-way, I may here remark on the possible derivation of the old English phrase "Kempery man" and the Anglo-Saxon cempa, signifying "a warrior," from the Japanese Kempo. This is a point which should not be without interest to etymologists, and particularly to those who follow the late Professor Max Muller in his theory of the Indo-Germanic origin of the Anglo-Saxon Race. Kempo, of course, was a system of attack and defense which branched off from ju-jutsu into the paths of strenuous endeavor, but, apart from the fact that it was less scientific than, ju-jutsu, it was declared an illegal practice when the sanctity of human life was recognized under the new regime. What is Kenpo? Kenpo is a modern Martial Art that has roots going back into China in the 13-1400's. It was the family style of the Yoshida Clan on Kyushu Island in those times. During the Meiji Restoration, it was outlawed as being too dangerous for a modern country like Japan was going to become. Thus, it went underground and was taught only to a few people. It remained secret until the early 1900's, when, for political reasons, it was taught to an outsider named Mitose, an Okinawan name. James Mitose retained the old system of deadly combat. What he passed on to William Chow is uncertain, but we know Chow updated it to the standards of today and ensured that it retain its deadly skills for life and death combat.